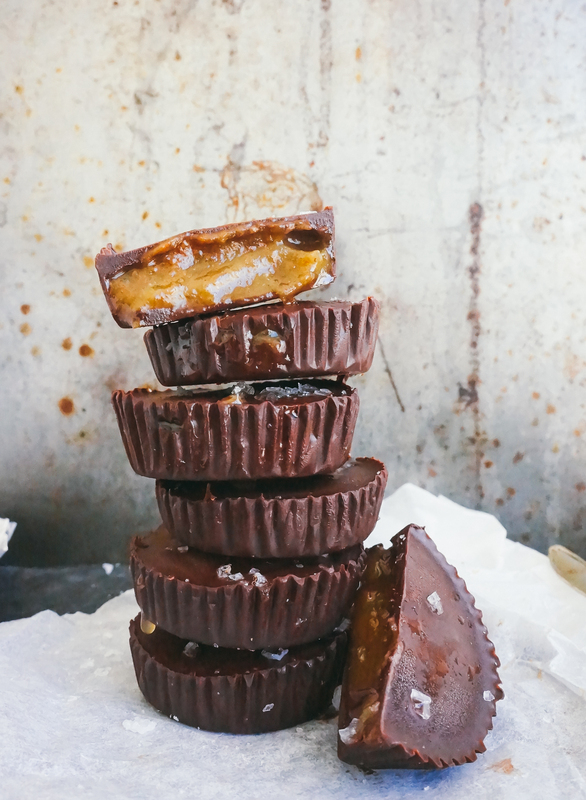 We’re so excited to be sharing this droolworthy Miso Caramel cup recipe by a fellow blogger friend of ours Anett Velsberg. You should know by now that we are huge chocolate fans, and who doesn’t like chocolate + caramel?! Melt half of the chocolate over a water bath, making sure that the bowl covers the pot completely and there is no steam coming out (water will make the chocolate coagulate). Brush the insides of muffin cases with the chocolate, stroking upwards. Another way of doing this is to put a tbsp of chocolate in a mould and swirl around the edges. Place the cases in the freezer to set for 10-15 minutes. To make the miso caramel, add the miso paste, dates, lime juice, salt and a 2 tbsp of water in a blender and blend until smooth and creamy. If necessary. add a couple more tbsp of water. Take the muffin cases out of the freezer and place a tbsp of miso caramel in each. Melt the remaining chocolate and fill up the cups, sprinkle some flaky sea salt on top, then place in the freezer again for 15 minutes. Keep in the fridge after that. Enjoy! For more of Anett’s recipes, check out her blog! !